If you’re a manager, you’ve got workplace horror stories. You know, that new hire from hell who chased away your biggest account. The budget cut that torpedoed your six-month-long project. That sweltering July when the building’s air conditioning system decided to retire. But it gets spookier. You can deal with those one-time scares. There is, however, an ever-creeping shadow that dims most workplaces at the worst times, and it permeates at will. And all the sinister shenanigans that go on in the workplace, strangely, are preserved on film. What the heck is going on with Denise in accounting? She’s angry about something and you don’t know what. Is it something you did? Said? And what about Phil? He’s been taking a lot of days off and his performance is getting uncharacteristically wobbly. And Mr. Johnson, your boss, stopped saying “good morning” to you. What’s wrong with these people? Short of insulting your mother and unloading pea soup on your office floor, they’re possessed. Not by demons, but by the vicissitudes of life: the workplace carousel, their mundane jobs, disobedient kids and unrelenting spouses, unpaid bills and unfulfilled dreams. Though it’s your head that’s spinning, it’s really nothing you can fix. Some people just need their space to self-correct. Ever feel like Police Chief Martin Brody? He’s the low-level manager caught in the middle of corporate calamity as a super-sized, gluttonous shark terrorizes his beach hamlet on a lucrative weekend. Brody wants to do the right thing—close the beach—but is overruled by his boss, the mayor, who puts revenue ahead of safety. You’ve been there. You get an order from above that requires you to (a) communicate it to fickle, frightened employees; (b) implement the why-are-we-doin’-it change while maintaining morale; (c) keeping customers, clients and vendors happy and on board during the shakeup, without interrupting profits. Sometimes you just need a bigger boat. All it takes is one unpredictable weirdo in your workplace. If you have one, you know what we’re talking about. He’s the guy who’s generally calm, doesn’t say much, snickers at the wrong stuff or for no reason at all, and has shown flashes of going over the deep end. With him, you don’t hear the manic revving of a well-oiled chain saw, but you sort of catch the scent of the two-cyle exhaust left behind by one. Knowing that he’d have a tough time landing another job is what makes the job you gave him so guardedly important to him. Getting canned could be his breaking point. There’s enough there to put the staff on high alert if you fire this guy. All that’s missing is the graveyard fog. If it weren’t for most of them harmlessly thumbing away at their phones, you’d be thinking they’re all about to rise from the weekly staff meeting table to corner you. 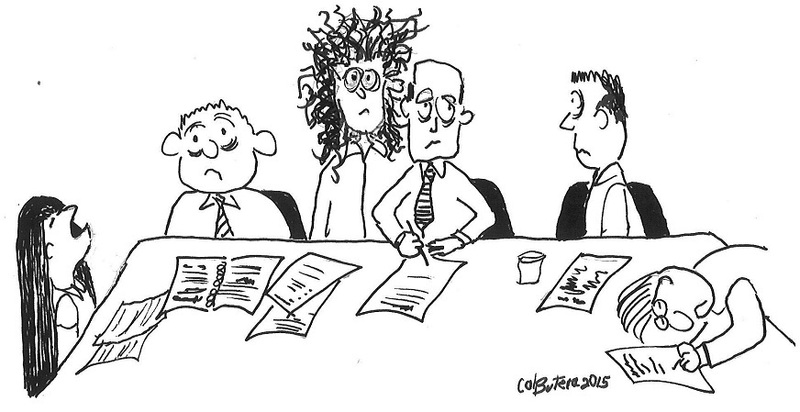 Lethargic and cadaver-eyed, your employees are generally unresponsive, caring little for the content of the meeting. Although their shoes leave no cemetery dirt on the conference room carpet, they cast a chill in the air, ushered in by sheer apathy. Unfortunately for the company, they begin to come back to life around 4:55. Here’s the mystery: Who brought them here? For you, it’s not the gathering of crazed birds. It’s the gathering of these menacing phantoms: negativity, pessimism and the morale-busting cliques. Was it Jill, the marketing assistant, who has a knack of ginning up a gossip group? Was it sales rep Joe, who has a politician’s touch for creating factions? Regardless of how it got there, it’s present and it threatens to peck holes in morale and productivity. Difficult to shoo away, these problems—like the birds—have their strength in numbers. Barry seemed like such a great hire! His résumé was flawless, his personality absolutely magnetic. Then, in the middle of a stressful meeting in which he’s called to task openly for the first time, the creature bursts forth: a defensive, resentful, angry horror unable to handle criticism, one that had been hiding inside him all along, waiting for the right moment to jump out at the staff, red-faced and bitter. Gahhhhh! Someone spray that thing with a hose before it gets into the air ducts! It’s mighty tempting for a boss to keep tabs on his or her employees either through video or online monitoring. Sort of like if you think you have ghosts roaming around your home. You set up the cameras and other sensitive ghostbusting equipment in hopes of glimpsing some paranormal activity. Not so in the workplace. Instead of seeing Chad being dragged out of his cubicle by an invisible phantom, you’ll see Chad being dragged out by Jack, who wants to discuss Fantasy Football strategy with him. Or you might catch Beth in a trance, not because she’s mesmerized by a wispy apparition, but she’s enraptured by the funny cat tricks she’s watching on YouTube. This is called normal activity. Enjoy the footage. The all-new Employee Operator Manual: No boss should be without it!